If you love to shoot pool, professional or not, shouldn't you have an exquisite table to shoot on? Our F.X. Gantner inspired custom pool table is hand carved by our master woodworkers and made from solid walnut. Choose any custom pool table design from history and we will build it just for you. That means custom, made to order, to your exact specifications. 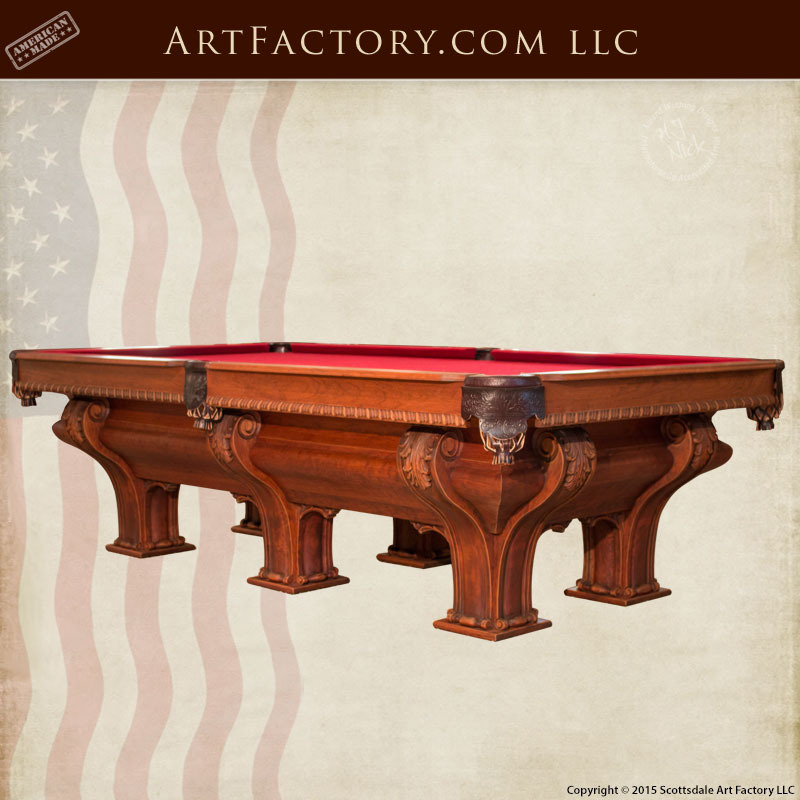 ArtFactory.com can help you create your own custom game and pool tables using any antique or new design handmade in original craft. This pool table is made with 6 legs to keep to the original design. Our master carvers hand carved the legs and outside edges of the bumpers. The pockets are made from hand tooled leather and the diamond markers on the bumpers are inlaid with mother of pearl. With choices of finish and felt, you can make this pool table yours. Imagine this beautiful piece of fine art history in your game room. This custom made pool table takes its six-legged styling from the F.X. Ganter tables, originally made in Baltimore, Maryland in the late 19th and early 20th centuries. Francis X. Ganter came to America in 1870, the son of a German cabinetmaker, and continued woodworking throughout his life, founding a retail showcase company in 1876. F.X. Ganter became known as one of the premier case builders in the country, supplied stores across the country, and even exported his showcases to Europe. He expanded into bar fixtures and bar games, including pool tables, later as a side business. His is a story of family tradition, continuing the trade of his father, much like H.J. Nick continues the trade of his grandfather by creating the handcrafted functional artwork at ArtFactory.com. Bring a piece of tradition into your home. This is a master hand carved solid domestic walnut custom pool table. Six leg 4.5' x 9' - Redesigned by H J Nick using the historical record (see AHRPT900) from one of FX Ganter's originals made 1898-1900. See matching custom cue cabinet. Order an H.J. Nick Original Work (which means you have the only one in the world ever made). Built in original craft, not reproduction, quality. Designed from the historic record. Made from solid old growth black walnut with matched grain. Designed in cooperation with the customer and artist/designer H.J. Nick. Features include vulcanized gum rubber cushioned rails with solid walnut hardwood top rails, mother of pearl diamond sights, 24 ounce billiard cloth, fine quality precision ground Italian slate, and handmade leather pockets. Contact ArtFactory.com to order your custom pool table. Call us to discuss your custom pool table and wood furniture design ideas 1-800-292-0008.